This interaction between the ears, the fingers, and the writing mind struck our interest back in 2012, and we put out a call to readers to suggest the best pieces of music to write by. Some readers found that silence made for the best—or only—accompaniment. Many more made recommendations ranging from Miles Davis, to minimalist composer Steve Reich, sitar maestro Ravi Shankar, the classic Krautrock sound of Neu!, the dub reggae of King Tubby, the violin Sonatas of Bach, and the ambient soundscapes of Brian Eno. We took it upon ourselves to compile a sampling of your suggestions with Youtube videos at the time. Now we offer above a more portable Spotify version of our “music to write by” playlist---over 13 hours of music. (Stream it above. Or find it online here. If you need to download Spotify, grab the software here.) I’ve added Alice Coltrane, Grouper, and the beautiful ...Until We Felt Red (2006) from one of my favorite guitarists, Kaki King. I hope this playlist inspires you, or at least inspires you to make your own. While it could go on indefinitely, the key to a good mixtape is the art of judicious selection. Please tell us in the comments, what would you absolutely have to add? What artists, composers, and musicians get you in the mood to write, help you shift tempos, or move you from major to minor keys while you compose, whether you write nonfiction, poetry, technical manuals, or the Great American Whatever? We'll add many of your suggestions to the playlist over the next few days. I definitely would recommend Zoe Keating for the playlist. Amazing cello playing and use of loops. I’ve never been more focused while listening to music. What do I write to? Everything. usic is aural voodoo. It freezes the hurricane of ideas so that I can examine a moment, replay it to understand what I should make it, or what a character feels. Boo on the Spotify links, boo. Find this almost unlistenable mess, sorry. Hiss!!! Booo!!!!!! to the sign up for Spotify rubbish!!! ENOUGH with collecting our data!! It is OFFENSIVE!!!!!!!!!!!! First, get out of my way with this Spotify collect my data and track me nonsense. Second, any of this can be found on Utube and downloaded converted to mp3 easily — WITHOUT being bait for Spotify. But “music that helps you write”? Write of what?! Kaki King? Are you kidding?! 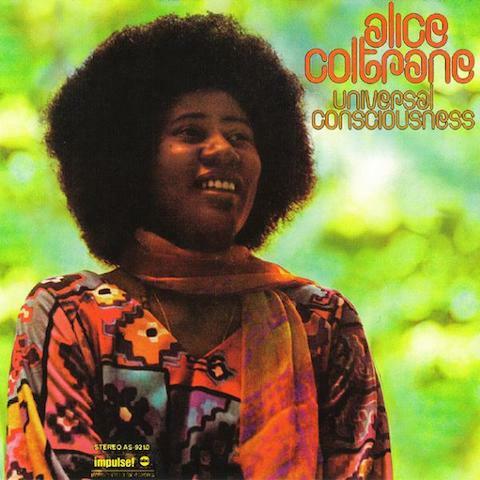 Alice Coltrane – Universal Consciousness?!! Are you insane?! What? It’s like a hot wire through me head. Is Open Culture a P/R shill for King et. al.? Pulease! This stuff has got to violate the rules of the Geneva Convention. I’d rather be water-boarded! Take a suggestion from a REAL writer (James Baldwin) and listen Bessie Smith. OMG WHERE does Open Culture find these preposterous pundits of the pen? Dump junk like this in my email box again and I am outta here! You DO know that none of the Spotify links work, right? Not sure what happened, the Sean Lennon playlist worked fine, but this one… meh. I highly recommend the music of Bohren & Der Club of Gore. Dark, doomy and slow jazz and tracks that are around 8 or 9 minutes long. Just perfect. And Brian Eno’s Music For Airports of course. But that’s too obvious.